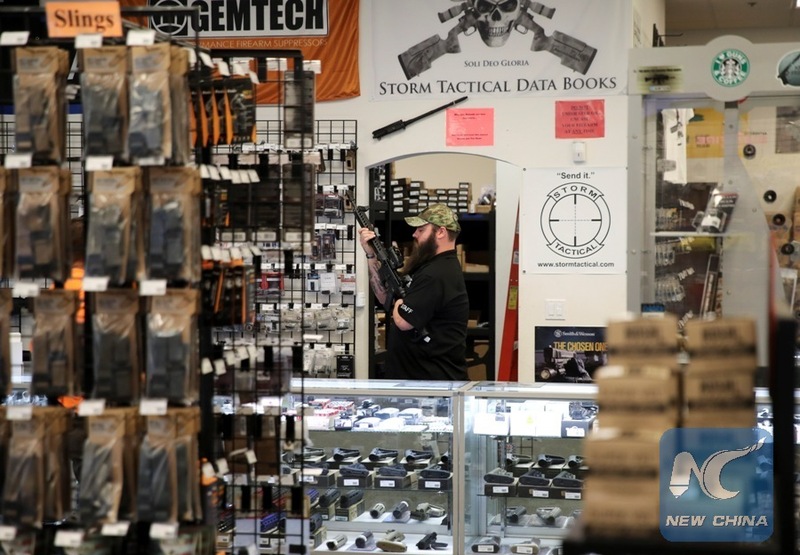 WASHINGTON, Oct. 4 (Xinhua) -- In the wake of the worst mass shooting in U.S. history, Democrats on Wednesday began a push to tighten gun control, although they are unlikely to get far, experts said. Sunday saw the deadliest mass shooting in U.S. history. The identified shooter, Stephen Paddock, attacked concert-goers at Mandalay Bay Resort and Casino in Las Vegas and later took his own life, killing at least 59 people and injuring more than 500 others. Local police found over a dozen additional firearms and explosives in his room, according to local authorities and news reports. In light of the horrific event, Democrats on Wednesday pushed for new gun control legislation. Congressman John Lewis, who has spearheaded the push for tougher laws, called for Americans to have "moral courage" in this issue. All Congressional members should have courage to bring common-sense gun control to a vote, Lewis said Wednesday at a press conference at the U.S. Capitol building. However, experts said Democrats are unlikely to get far in gun control for the following two reasons: First, Republicans, supporters of the constitutional right to bear arms, control both the Congress and the White House, and GOP lawmakers are firmly against anti-firearms legislation. Second, there is historical precedent. Even after the 2012 shooting incident at Sandy Hook elementary school in the U.S. state of Connecticut, which resulted in the deaths of so many children, Democrats failed to pass a gun control bill. "If they can't get any (gun control) measures after Sandy Hook, I find it hard to believe they can get any measures through a GOP-controlled congress," Republican Strategist Ford O'Connell told Xinhua. Indeed, a large chunk of Americans own guns, and firearms are a part of the culture of self-sufficiency and independence ingrained in the United States. According to a report published in June by Pew Research Center, a Washington-based think tank, 48 percent of Americans either say they grew up in a household with guns or currently own guns, and around seven in ten say they have at some point fired a gun -- even those who have never owned a firearm. O'Connell said Democrats may ignore the importance of guns to the owners. "This is something that fires up the Democratic base," he added, speaking of the gun control debate. Many recent firearms legislation debates have occurred amid bitter partisan rivalry, the likes of which have not been seen in decades in Washington. At the same time, some Republicans said Wednesday they would be willing to consider a ban on "bump stocks" -- a device speeding up a gun's rate of fire. The Senate's No. 2 Republican, Sen. John Cornyn, said he'd like to have a hearing on bump stocks in order to learn more about that issue. Still, that is a small issue in the overarching gun control debate, experts noted. Americans have a long and complex relationship with firearms. The right to bear arms is enshrined in the Constitution, the highest legal authority in the United States. Experts differ on the details, but the nation's founding fathers viewed an armed population as necessary to keeping the nation safe from foreign invaders. Moreover, historians say that some regions were once sparsely populated. In those areas that were short of security forces, citizens needed firearms to protect their land and families. Pew Research also found that despite disagreements, gun owners and non-owners have reached many agreements, including restricting access to guns for individuals with mental illnesses and those who are on federal no-fly or watch lists. Gun owners themselves also have diverse views on gun policy due to their party identification, according to the Pew Research report which surveyed 3,930 adults, including 1,269 gun owners. The survey found that self-protection tops the list of reasons for owning a gun, with 67 percent of firearms owners giving this answer. For most gun owners, having a firearm is tied to their sense of personal freedom, with 74 percent of gun owners saying the right is essential, compared with 35 percent of non-gun owners.